It’s a difference only the most avid fans would notice even today. But the MMA world changed considerably in June. The day before UFC 199 in Los Angeles, the UFC held its weigh-ins in the morning, breaking from a long-standing tradition (and rule) of fighters weighing in closer to 24 hours before their bouts. And rather than the competitors being shuttled to the show venue, they hit the scales right in their hotel. Earlier weigh-ins were conceived by doctors and regulators at a weight summit held by the California State Athletic Commission (CSAC) in December 2015. Bellator was the first to try a morning weigh-in before a February event in Kansas and did it again in April at Mohegan Sun in Connecticut. California was able to make it a state statute soon after and the UFC tried it for the first time June 3. The promotion has done it every card since, aside from one in Australia where the timing did not work out. Bellator, Invicta FC and many other organizations have followed suit. The idea behind an earlier weigh-in is to address a major problem in MMA: extreme dehydration to make weight. Doing a weigh-in in the morning rather than the afternoon does not stop extreme weight cutting, but it gives fighters more time to recover (and rehydrate) in between the scale and the fight. A byproduct has also been fighters are now spending less time dehydrated. UFC fighters in the past usually had to make weight up to four hours before the weigh-in, because of travel time to the arena and waiting for the weigh-in show to begin. 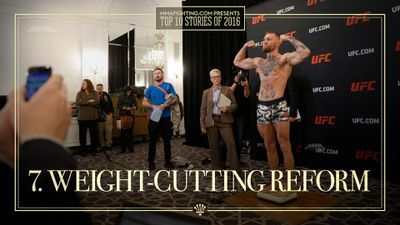 That’s a long time in a depleted state — backstage at television weigh-ins used to resemble a morgue. No more. While regulators say that more changes will need to be made, the earlier weigh-in was a major step in the right direction. The greatest fear among doctors who know the sport is fighters entering the cage dehydrated. Not only does it reduce motor skills, reflexes and other attributes, it increases the risk of head injuries and knockouts. The fluid around the brain is reduced when dehydrated and takes a longer time to rehydrate than the rest of the body.